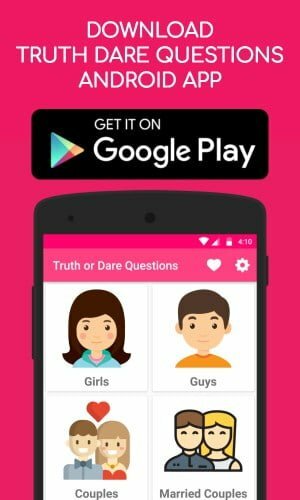 Let’s check our collection of best truth or dare questions for school students. You can try these questions when you are playing truth or dare game with your friends in your school. Enjoy our truth or dare questions for school students and have memories for a lifetime. Do you like ghost stories? Have you ever cheated on any examination? Have you ever made a prank call to your teacher? Have you ever blamed someone without having their mistake? Which college would you like to join after your schooling? What is the best vacation spot you’ve ever went with your friends? What is the most annoying thing that you’ve done to your best friend? What is the most expensive thing you gift to your best friend? Have you ever try to watch a movie without letting your parents know? Could you live for ten days without talking to your friends? What is your all-time favorite music album? Have you ever had a crush on your best friend’s boyfriend/girlfriend? Who is the worst teacher you have ever had in your school? Who is that one celebrity you’re obsessed with? Hope you like our list of best truth questions for school students. If you know any other truth questions for school students. Let us know in the comment section below. Eat a full packet of bread without sauce or ketchup. Drink full bottle of mango juice. Dance without music for 3 minutes. Do wall chair for the next 5 minutes. Eat 5 full spoons of sugar. Try not to snooze if someone rubs your nose by using cloth/paper. Spin around 10 times and walk down the street. Walk with your hands from front to back and vice versa. Sing any sad song standing outside as loud as you can. Hold your friend’s shoe and stand for 5 minutes. Do an impression of your favorite teacher. Eat three full spoons of ghee. Pinch yourself until it turns to red. Create bubbles using soap water. Hope you like our list of best truth or dare questions for school students. If you know any other truth or dare questions for school students then please let us know in the comment section below.